One more thank you out of a few I made for the Simon Says Stamp Monday Challenge. I had a lot of fun creating this card. 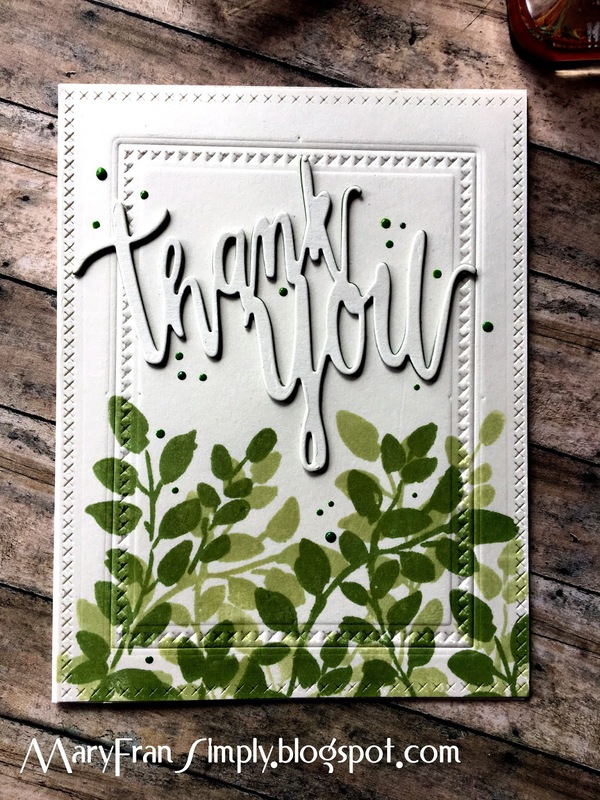 I stamped some cream colored cardstock with the leaves in green with first and second generational stamping. Next I used some a cross-stitched set of rectangle dies- embossing the smaller one and cutting the larger finished panel with the largest rectangle. I then cut the word 'thank you' out of the cream colored cardstock and then three more times in green. Once finished I stacked the word together and glued them with some Ranger Multi-Media Matt. I placed it in the upper center position and adhered that as well. For a finishing touch I dropped some liquid Ranger Enamel Accents. They're just as easy I find as the Nuvo Drops to use. That's it! Thank you for reading and the materials used are listed below.